The largest of Spain’s Canary Islands, Tenerife is one of the most popular diving destinations in Europe. It sits off the west coast of Africa in the crystal clear water of the North Atlantic Ocean. Compare flights to Tenerife South and you’ll find that it is easily accessible from Europe and the rest of the world. Often called the “island of eternal spring”, Tenerife has a diverse landscape of pine forests, wildflower fields and rugged cliffs leading to golden beaches. Colourful coral, shipwrecks and exotic fish can all be seen beneath the beautiful blue water of Tenerife. PADI and BSAC certified instructors and guides from Tenerife Dive, Aqua-Marina, Ocean Trek Diving Centre and Atlantic Divers offer diving excursions to many popular sites. From the novice to the most advanced and adventurous diver, Tenerife has a dive site and school to suit all. The Condesito Shipwreck is a great dive site for beginner and advanced divers. The Condesito was a freightliner that wrecked near the shoreline of Punta Rasca more than 30 years ago. The hull, cabin and engine room are intact and have become home to a large array of colourful fish, coral and underwater plants. Rainbow wrasse, trumpet fish, tiny boxfish, stingrays and an octopus or two can often be seen swimming along with divers. The Rays at Los Chuchos is a unique experience for all levels of diving devotee. Popular with photographers, videographers and nature nuts, this peaceful place is filled with schools of rays that glide across the golden sand floor and drift past a small wreck site. Dive and swim among all sizes of rays from small bat rays to large eagle and sting rays. Located ten minutes from Los Cristianos and Las Galletas, Palm-Mar Cave, or Cuevo Del Palm Mar, is a thrill for advanced and deep divers. Crystal clear water gives incredible visibility to view large rocks, a cave, lobsters, Atlantic barracudas and several species of moray eels. Though gentle and inquisitive, some of these toothy eels are quite ferocious looking. The deep, dark mysterious cave is best viewed from the outside. It has a series of mazes and no one knows how long it is or where it leads. A cross at the entrance commemorates the divers that have died while exploring this cave. Another interesting image is a statue of the Virgin Del Carmen, which was erected to give protection to the divers and fishermen on the island. Beginner to advanced divers will find that Tenerife has just as much beauty and adventure beneath its sparkling surface as it does above. This post was submitted by travel blogger Nicholas E cheapflights.co.uk. It’s his job to travel the world and give fellow travellers advice on a range of topics ranging from the getting the best deals on your flights to New York to the best diving spots in Tenerife. 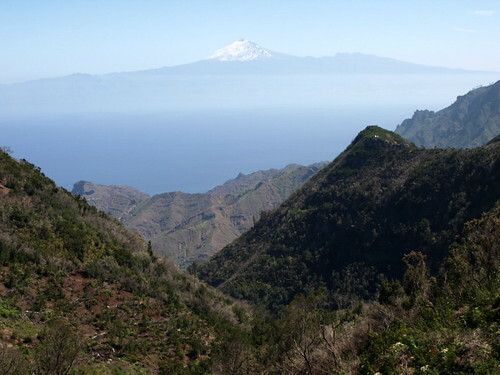 Having just spent an idyllic long weekend on La Gomera, it strikes me that most visitors to Tenerife never see anything more of our neighbouring island than the stunning canvas it lends to the nightly sunset, or glimpses of its shoreline from dolphin watching trips along the Los Gigantes and Los Cristianos coasts. 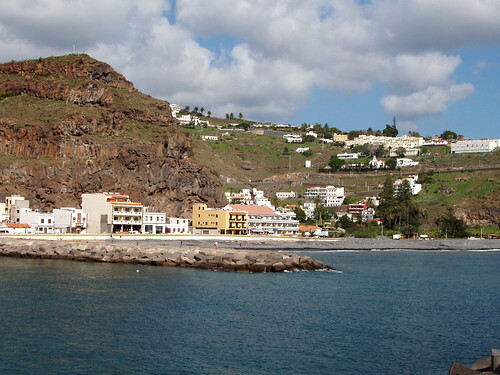 For those who make the effort to take the ferry across the water, a forty minute sailing lands you on an island which is a far cry from the bustle of their Los Cristianos departure point. La Gomera was once described by a friend who has lived on the island for some 14 years as being shaped like a circular tablecloth that someone has pinched in the centre and raised off the table. Steep barrancos (ravines) create deep folds in the landscape that run from the coast to the central rainforest of Garajonay National Park, making travel a time consuming and sinuous business, and farming a back-breaking toil. 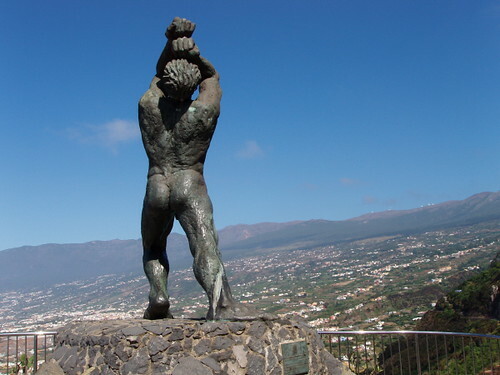 The difficulty of easily traversing such a landscape, combined with rocky coastlines, strong currents and sheer cliffs which prevent the coastline from getting sucked into the Tenerife addiction of beach building, has meant that La Gomera remains mercifully devoid of large resort development. 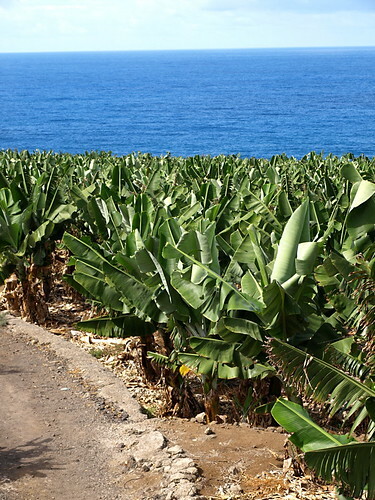 The down side to that equation is that many of La Gomera’s younger generation have abandoned their agricultural inheritance to make the weekly commute to Tenerife for an easier living and bright lights, leaving La Gomera low on economic development opportunities. But the island has seen an influx of (mainly German) immigrants who have invested in renovating traditional properties, opening restaurants and select rural guest houses and cultivating fincas. The end result is an island of rare beauty, unspoilt by tourism. I’m not a fan of coach tours with their prescriptive itineraries and refreshment stops which often bypass local pockets, but if you want to tour La Gomera in a day, on this occasion it’s probably your best bet. Confident drivers can hire a car at the ferry terminal and explore independently but for anyone who doesn’t have experience of driving abroad and on mountainous roads, letting a coach take the stress has a lot to be said for it. Those who prefer a more leisurely day can wander around the capital of San Sebastián where the ferry docks and from whence Christopher Columbus set sail on his globe-changing voyage of 6th September 1492. 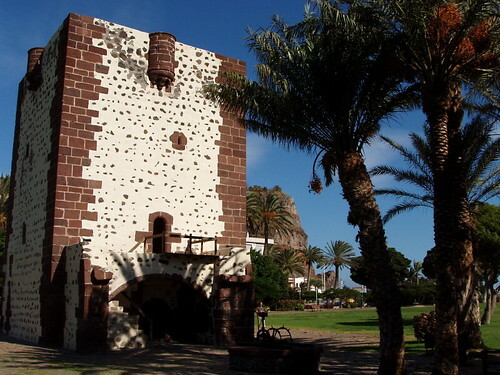 Buildings of note are the iconic Torre del Conde (above), the little church of La Asunción and Columbus’ House where the eponymous hero stayed prior to his epic voyage and which is now a museum. 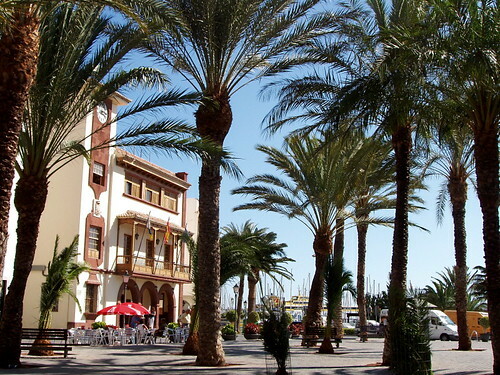 There are shady pavement cafés and restaurants serving very reasonably priced menus del día of typical Canarian cuisine and lots of places to stroll and enjoy the tranquil atmosphere. Visitors in the north of Tenerife should consider taking a day return flight on BinterCanarias or IslasAirways who fly into the airport a short taxi ride from the resort of Playa Santiago. Best known as the location of the La Tecina Hotel, Playa Santiago has seen a small but steady growth over the past five years and now offers a picturesque marina; a small, black sand beach; nice restaurants with promenade views and a good selection of shops. It’s a laid back, one horse sort of resort where the default setting is sunny and life moves at a ripple pace – the perfect spot in which to enjoy a very different Canary Island for a day. As soon as we heard that Ministry of Sound were going to be appearing in Santa Cruz on the first Saturday night of Carnaval 2011 it was a foregone conclusion. We would be there. There was much debate over how we would get in and out of the city, tales of traffic mayhem being rife, but the prospect of long walks, a bus ride dressed as Hit Girl and Brother Jack, another long walk and no idea of how we would get home again settled it. We’d take our chances and drive into the city. I drew the designated driver short straw and we set off around 10.40pm to give ourselves plenty of time to check out all the venues in the city before heading to Plaza Europa to share the Ministry of Sound experience. As it turned out, driving into the city couldn’t have been easier. We arrived at the bus station car park to find plenty of spaces (the Canarios don’t tend to like paying for parking when an empty pedestrian crossing costs nothing) and with the final touches applied to our costumes, headed off into the surreal pandemonium that is carnival. Everywhere we went, the sights and smells of food assailed us, from candy floss and sugared almonds at the fairground, through baked potatoes and hot dogs along the paseo marítima to the amazing food stall in Plaza Candelaria with its Desperate Dan– sized montaditos and its rotating barbecue on which half suckling pigs sizzled. Everyone who wasn’t eating, and most of those who were, were drinking, and the ground was littered with carrier bags bulging with bags of ice, bottles of Jack Daniels, Smirnoff, Arehucas, cans of Red Bull and bottles of coke from which groups were serving themselves generous refills in between salsas. Beer stalls lined every street, their counters propped up by escapees from a drug-induced nightmare, and a giant plastic lime with its top half sliced and opened served as a bar for a mojito mixing barman dressed as a bee. We made our way first to Plaza Principe where a very traditional band was just warming up a crowd who were enjoying their salsa under the stars. Next it was on to the small stage below the Plaza where a rock band were belting out Spanish and US classic rock anthems to a select gathering. As the clock ticked towards Ministry of Sound time we headed to the main stage at Plaza Candelaria where thousands of fancy dress clad revellers were getting into their stride to the Maquinería boy band who were belting out a lively stream of carnival favourites accompanied by some very nifty dance moves. By now, the Carnaval spirit had us by the throat and there was only one place that we needed to be. As the lasers scanned the night sky, and over a steady dance beat, a deep voice intoned a monologue that told us of a night when it was written that a new generation would come and dance until the ground shook. As the volume pumped up and the Ministry of Sound roadshow took to the stage, the prophecy came true. Unfortunately, my flip camera also shook and the microphone gave up the ghost on the volume. So with suitable apologies to Ministry of Sound for failing to capture the full force of your music, here’s a taster of Santa Cruz Carnaval 2011 . the food, the music and the people.